Location: Saint-Priest-Taurion, in the Haute-Vienne departement of France (Limousin Region). Notes: Château de Salvanet is a castle of the eighteenth century, located in Saint-Priest-Taurion Haute-Vienne.The history of the earth and its lords Salvanet is known since the Middle Ages. This territory was then the stronghold of the famous feudal house Comborn known since the year 962. But the recent history of Salvanet really begins in 1509. That year, the Dalesme Châtelus family bought the land Salvanet his castle, outbuildings and farms to live in peace for more than three centuries. The Dalesme were indeed owners of this field until 1849. 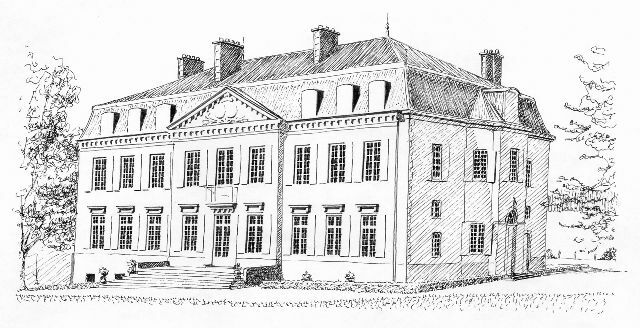 In the eighteenth century, they still inhabited the old palace in the heart of the fief of Salvanet, on a slope overlooking the Taurion valley. But in 1772, they decided to install a new home, which would benefit the site and a wide open view towards the Taurion. The architect Joseph Brousseau, helped his brother Mathurin Brousseau entrepreneur, originally from Limoges was in charge of the project. He was a prominent person and renowned for the quality of his work. The brothers participated in the construction of the Bishopric of Limoges. They built the Episcopal Palace of Sees, and many churches, museums and hospitals. They are also the authors of the Hotel de Rigoulène in Saint-Léonard-de-Noblat and castles Faye, Lavergne, Thouron, Brignac, La Cosse, etc.